Blaize…I loved the article on van cats…it definitely will help me when I go to RVing too. One thing I wanted to mention about Devan’s post and it might be useful to a lot of other’s with pets on the road…get a good pair of dish washing rubber gloves and just lightly wet them and they will remove the hair from most pets with such ease, you’ll wonder why you ever tried those rollers…I have tried them and they either are so costly, because you need to keep pulling more sticky parts up or the ones that don’t require paper, that are supposed to pick up hair and such…don’t work…I spent the money on them and it was a total loss…even to rinse them off was a pain…it took forever…not like the TV ad at all. When you use the rubber gloves and just rinse them off…it all comes off so easily…I use them to get hair off of my slacks or jeans too…works great!! Thanks for this tip to remove cat hair, Janet. I’ve never tried this technique, but I’m going to keep it in mind. Glad you are enjoying my posts. Thanks for reading. Alas, I do not travel with Basil. He travels with the fabulous Devan Winters. I do have a sweet dog in my life, but no cat. 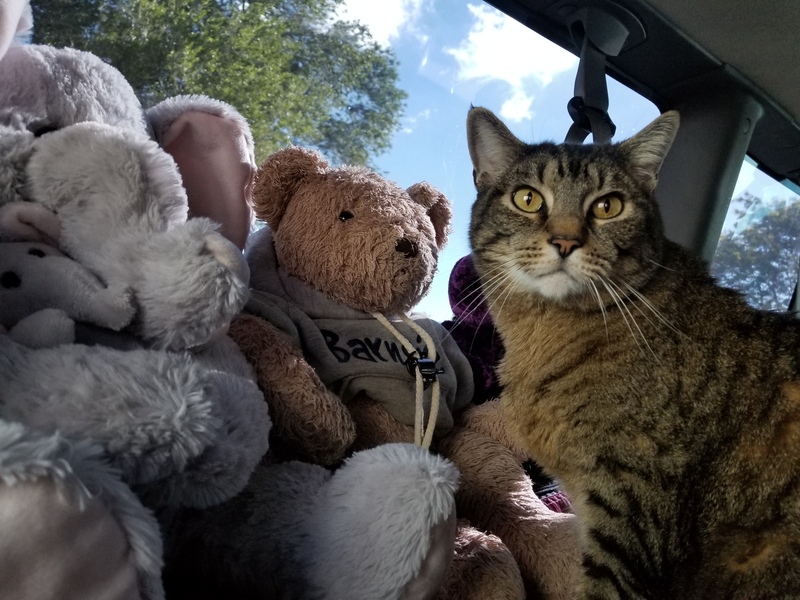 what do you do when you need to go somewhere and leave the cat in the van? Hi Jet Black! Thanks for the question. I’ll pass it on to Deven and ask her to respond here. Leaving a cat in the van when you’re away takes a lot of research and preparation – each time you’re in a new location. I do not tend to spend time in places that the temps go above 90 more than a few days each summer. You have to test your set up, every new place you go, before you leave your cat in your van… or they could die . The climate in San Diego is different than the climate in Flagstaff which is different than the climate in Taos, etc. 90 degrees feels different in each of those places. I will spend a 90 degree day in the van with the windows open and blinds up to see what it feels like and to see how Basil is handling it. If it’s too much for me, it’s too much for him. If he starts panting or breathing hard, I know he can’t stay and I’ll immediately change location or change my plan. If you have solar and a roof vent (two vent fans blowing opposing directions is even better) it will help. I don’t have solar or a vent fan so I have to closely watch the weather. I also have a camera in the van that I can access via an app on my phone. I can watch Basil to see how he’s doing and keep an eye on the digital thermometer I placed inside the van as well. If it it’s a hot day I watch that closely and I don’t go far enough from the van that I can’t get back right away if I see an issue. You also run the risk of good Samaritans thinking they are helping by calling police or breaking a window. I keep blinds up, windows cracked (but covered other thanwhere air doesn’t need to flow), and a small sign in my side windows and on my dash that isn’t super noticible. I don’t want to draw unessisary attention with a large sign so something small is perfect if someone is snooping because they saw Basil inside. The sign simple says that my van interior is temperature controlled and is monitored via security camera. It also notes my phone number if they have concerns. I hope some of this info is helpful and answers your question! Thanks for your informative answer, Devan. We appreciate it.